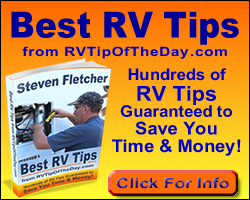 From time to time the black water holding tank gauge lights on my RV monitor panel stop reading properly.When this happens it is almost always caused by contaminated contacts inside the tank. Usually an extra good tank rinsing with the toilet wand is all that's needed. If that doesn't work I wash the tank by filling it with hot water and liquid laundry detergent and letting it stay for about and hour and then rinsing with the toilet want. After dumping and rinsing the tank I fill it 1/3 full and add laundry detergent. The agitation while driving usually does the job. About half the amount of liquid detergent called for in a normal washing machine load is enough. If it is cold or at least cool outside, bag or two of cracked ice dumped in the tank through the toilet just before hitting the road will scour the inside of the tank while you drive. This doesn't work as well in the summer time since the ice melts too fast to have enough time to scower the tank. Again, after dumping and rinsing the tank, I use a little more detergent and completely fill the tank using the toilet wand. Using the wand helps dilute the detergent and also creates some suds. Let the tank stand full and soak for at least an hour. Then drain the tank and rinse with the wand. Let the tank stand empty for a while to allow the contacts to dry and then check the gauge. If the system monitor still doesn't read right it's probably time to call a service technician. Except for using the wand and ice, you can use the same procedures to clean the gray water tank.